At lunch a few weeks ago, my friend Amy mentioned that she really enjoys Laura Calder’s Cooking Channel show, French Food at Home. Never heard of it, I said. For a person who makes her living food blogging (ha! yes, that was a joke), it is stunning how little I know. Honest to God, I had no idea such awesomeness existed. But when Amy appealed to my narcissistic tendencies and told me that Laura Calder reminded her a little bit of me, I ran right home to DVR the show toute de suite! As one of my best friends, Amy clearly sees me through very kind and loving eyes, for I am nowhere near as attractive and competent as Laura Calder. However, I did recognize that we share a certain dorky enthusiasm, passion, sincerity, and slightly know-it-all demeanor which I’d like to believe inspires more confidence than irritation. Needless to say, I think she’s fabulous! 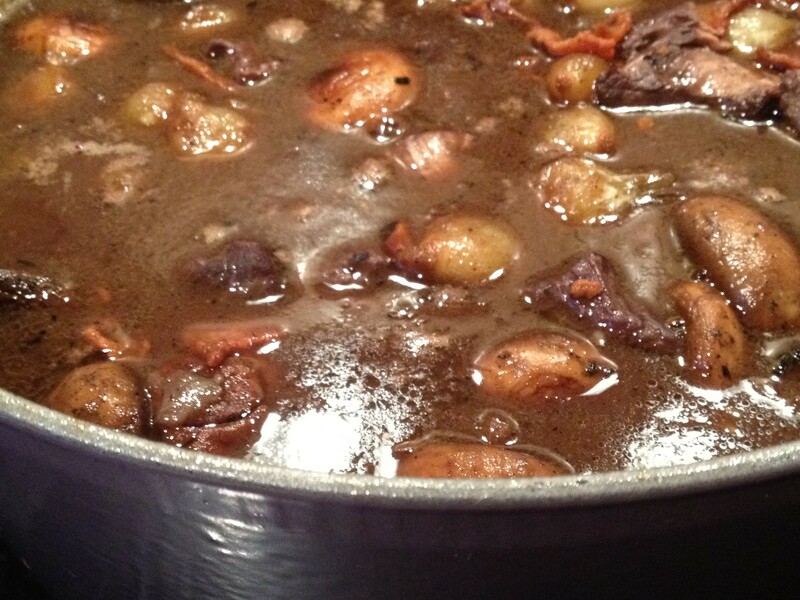 A couple years ago I made Julia Child’s Boeuf Bourguignon, and it was every bit as complex and wonderful as all the hype. However, it is a heck of a lot of work. Don’t plan to do anything else besides eat and do dishes the day you try to make it Julia’s way. I encourage everyone to try it at least once for the experience, but I was personally in no hurry to spend hours in the kitchen making it again despite numerous requests from Ed. When I saw Laura’s version of Beef Bourguignon, I was intrigued. It seemed so…relatively simple! Verdict? A very worthy Beef Bourguignon. All of the flavor, less than half of the work. I can’t imagine making this any other way now. Sorry, Julia, I still love you! Remove the meat from the refrigerator and bring to room temperature, about 20 minutes. Heat the oil in a large casserole. Working in batches, brown the stew meat well on all sides, removing as you go. When the meat is done, cook the carrots and onions in the same pot until tender and lightly golden. Add the garlic, and cook one minute. Add the flour and cook, stirring for 2 minutes. Pour over the wine and the stock. Add the bouquet garni. Return the meat to the pot, cover, and transfer to the oven until the meat is very tender, about 2 hours. While the meat cooks, prepare the garnish: Heat the oil, in a pan and brown the bacon, and remove. Add the onions and cook until browned all over, remove. Finally, brown the mushrooms, and remove. Deglaze the pan with 1/2 cup water, reduce, and then pour over the garnish. Set aside. When the meat is done, remove it from the pot. Strain the stock, discarding the vegetables. Pour the liquid back into the pot, and boil until thick enough to coat a spoon. Return the meat to the pan and add the garnish. Cover, and simmer until the onions are tender and the flavors have blended, 10 minutes. Adjust the seasonings. Serve. 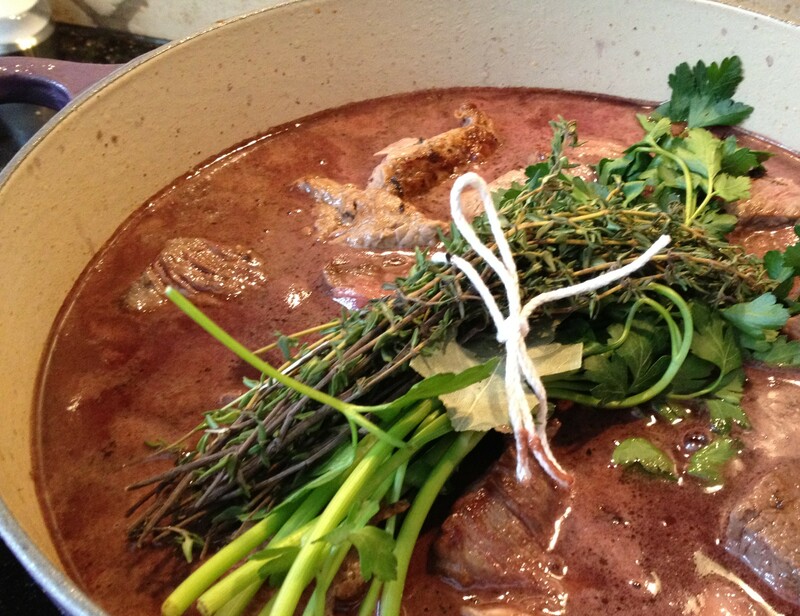 Does anything make you feel so French as tying herbs in a bow and saying “Bouquet Garni” to all who will listen? 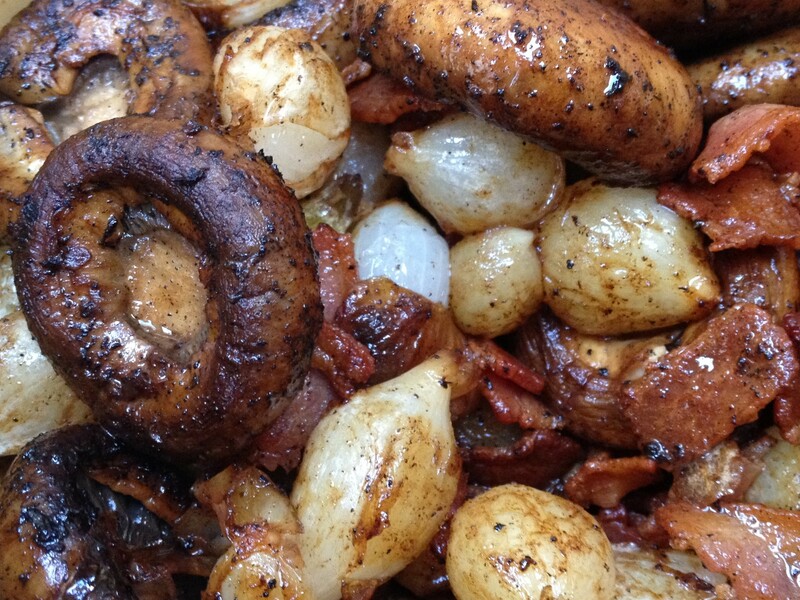 The garnish of bacon, mushrooms and pearl onions which gets added at the end. Voila! What it lacks in beauty, it makes up for in deliciousness. This entry was posted in Main Dish and tagged beef bourguignon, boeuf bourguignon, Food Channel, French Food at Home, Julia Child, Laura Calder by Mom Mom's Apron. Bookmark the permalink. I’m going to make this sometime this week. Where do you get pearl onions? I think I’ve seen them at Whole Foods, but I know I’ve had trouble finding them in the past. Do your kids like this? My kids LOVE this! Pearl onions are hit or miss. They always seem to be around my grocery store except when I actually need some. You can always use frozen pearl onions in a pinch and thaw before browning. I LOVE beef bourguignon! Ina Garten also has a great recipe for it that you might try out. It’s a little more complex than Laura’s if I remember correctly, but still quite easy to manage. I will have to check out Ina’s BB. Have you made Julia’s? You MUST! I absolutely love the premise of your blog and look forward to following you. Thanks for stopping by! 2 things make my mouth water and get me excited and all fuzzy inside. Cooking French or Italian food like they did in the past. Simple and delicious. This beef Burgundy dish is amazing. Laura Calder is amazing, She is the whole package. My dream is to have her to cook for me as we sip on a great French wine. Heaven on earth.